Everything you need for dorm cooking in one convenient set! Don't go to college without a set of sturdy kitchen tools! It's true that there will be no kitchen in your dorm room. But that said, you can still do a fair amount of cooking. Even if it's something simple like heating up soup, you'll still need some basic college cooking supplies to do that. 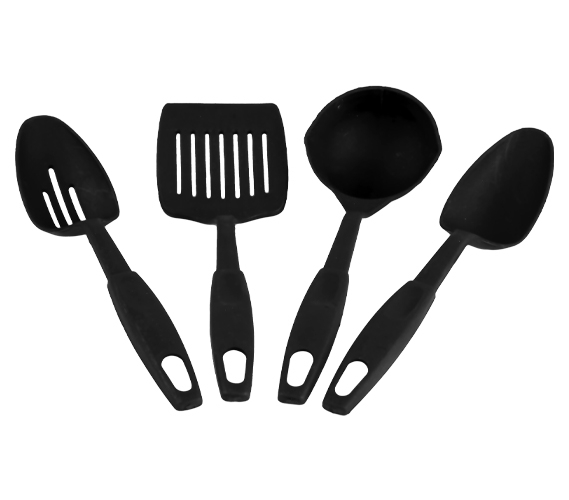 So for that purpose, add this 4 Piece Kitchen Tool Set. It has what you need for college to make simple dorm meals and can even be used for some more advanced college cooking! Cheap dorm stuff should appear throughout any college shopping list, as they're dorm supplies that will help save you money! Even if you're just heating up leftovers, you'll still need some college items to serve with and stir your food. And, no, sometimes it's not the easiest or most practical to attempt to use a little spoon for all those tasks. So for your simple meals, include this college cooking bundle. It's a basic dorm item that's an example of how dorm stuff for cheap can still too often be overlooked on some dorm shopping checklists. But if you're thorough while shopping for college, you'll include these dorm accessories to ensure even simpler meals. Don't let lack of utensils and cooking items hold you back in your dorm room "kitchen!"